' Without grief ' - That is the exact meaning of the word Ashoka. 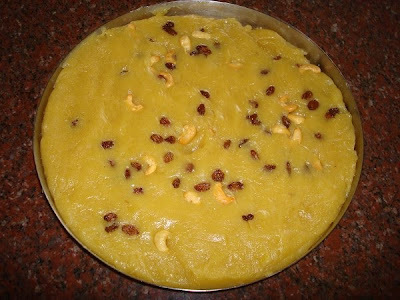 Ashoka Halwa or Happy Halwa is a festive sweet and is very popular in Tamil Nadu. It is a very simple and nutritious halwa which can be shared with the near and dear ones on the happy occassion of Deepavali. 1. Heat three tbsps of ghee in a heavy bottomed pan. 2. Add wheat flour and roast till it emanates a pleasant aroma. 3. The wheat flour should look like cream and not dry when roasted. Use more ghee, if needed, to get the creamy consistency. Switch off flame and keep aside. 4. Wash and pressure cook dry roasted green gram dal with 2 1/2 cups of water. The dal should be well cooked and mushy. 5. Mash the cooked dal well and add it to the creamy wheat flour. 6. Cook dal and wheat flour together blending with a spatula. 7. Add sugar and keep stirring till the sugar melts and blends with the dal and wheat flour mixture. 8. As it starts thickening keep adding ghee little by little stirring all the time. 9. 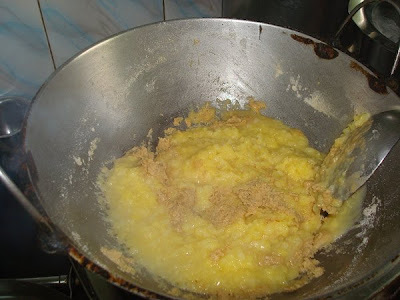 Cook till the mass leaves the sides of the pan and starts looking like custard. 10. Blend in cardamom powder. 11. Pour on a greased plate and level with a greased spatula. 12. 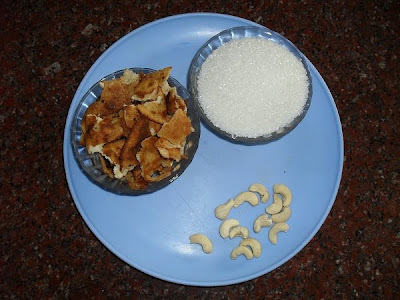 Fry cashew nuts and raisins in 1 tbsp of ghee and pour all over the halwa. Scoop out the halwa with a spoon when still warm and relish the flavoursome treat. When cold you can cut them into desired shapes and sizes. But do not forget to top the cold piece with a speck of ghee and microwave before you relish the halwa. Find yourself slipping into a happy trance as the Ashoka Halwa slides over your taste buds. We got this message via -mail today, and thought we should spread the word! New Delhi: If you had not heard of Narayanan Krishnan, as I had not, it is a collective failure. This is one of the most incredible stories of personal commitment. Narayanan Krishnan, all of 29 years old now, does what he was professionally trained to do as a chef. Feed people. Only Krishnan does not do this in the swanky confines of a 5-star hotel. Every day, he wakes up at 4 am, cooks a simple hot meal and then, along with his team, loads it in a van and travels about 200 km feeding the homeless in Madurai, Tamil Nadu. Krishnan feeds, often with his hands, almost 400 destitute people every day. And for those who need it, he provides a free haircut too. According to CNN, eight years ago, this award-winning chef with a five-star hotel chain was all set to go to Switzerland for a high-profile posting. On a visit to a Madurai temple, he came across a homeless, old man eating his own human waste. That stark sight changed Krishnan's life. Much to the dismay of his parents, CNN says, Krishnan abandoned his career plans and decided to spend his life and his professional training in looking after those who could not care for themselves. He has provided more than 1.2 million hot meals through his nonprofit organisation Akshaya Trust, and now hopes to extend this to shelter for the homeless too. Krishnan is the only Indian in a list of 10 heroes that CNN has picked worldwide to honour. One of them will be chosen CNN Hero of the Year, selected by the public through an online poll. If many Indians get together to vote for this inspiring man, he can win by a long mile. If Krishnan wins he will get $100,000 in addition to the $25,000 that he gets for being shortlisted for the Top 10. Akshaya Trust needs all the monetary support it can get to build on Krishnan's dream. Let's help him get there. Vote for Krishnan here. The poll continues through November 18 at 6 a.m. ET. This is a traditional festive sweet and it takes a prominent place especially in South Indian weddings in cone forms. The prepared sweet is moulded in a pair of conical containers and is called 'Manoharam Paruppu Tengai'. 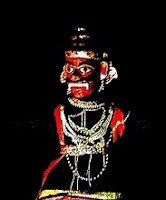 This occupies the central position among the other 'seer bakshanams' displayed during the wedding ceremoney. Seer Bakshanams are sweets and savouries presented to the groom's party and will be distributed among relatives during the wedding. The literal translation of Manoharam is Mind Stealer or Heart Winner! 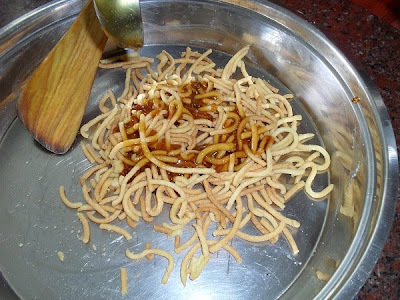 A savoury dish called Thaen Kuzhal (meaning Honey tubes) is first prepared and later dipped in jaggery syrup and is transformed into the delicious Manoharam. This can be relished as it is or formed into balls for easy handling. 1. Powder the three dals (lentils) smoothly in a mixer. To prepare Manoharam in a large scale the lentils can be powdered in the local mill. For people living abroad all types of flours are available in India Stores. 2. Mix rice flour and the tri lentil flour in a wide bowl. 3. Add salt and rub in 2 tbsps of ghee thoroughly into the flour. 4. Add water little by little and knead the flour into a smooth dough. 5. Add the remaining 2 tbsps of ghee and finish the kneading process. 6. Grease the inside of the chakli press ( a device to get strands of dough when pressed through it) and fill it with the dough. 7. Heat oil and press the dough into it simultaneously swirling your hands, so that the strands of dough form coils. 8. Cook on medium flame turning it now and then till the Thaen Kuzhal becomes crisp and turns into a light honey (thaen) colour. 9. Remove the Thaen Kuzhal with a perforated ladle and drain on a kitchen towel. It will become crisp as it cools down. 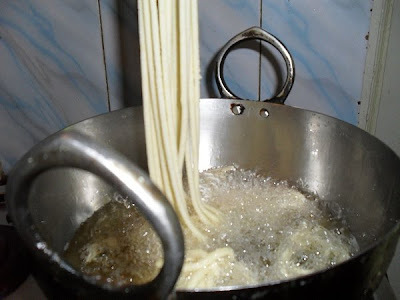 When a strand of the cooked savoury is broken you can see a fine bore running through the length of the strand making it look like a tube (Kuzhal). 10. Allow the Thaen kuzhal to cool well. 11. Melt jaggery powder in 2 gasses of water and filter it. 12. 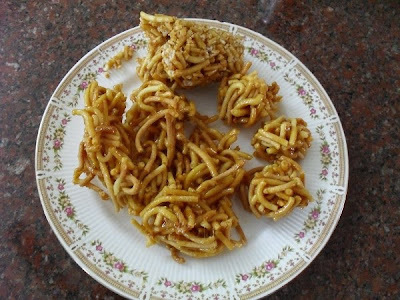 Break the Thaen kuzhal into small bits and spread them out on a greased plate. 13. Add ginger powder and cook jaggery syrup till it reaches a soft ball stage. 14. Remove syrup from flame and add it little by little to the Tthaen Kuzhal strands. 15. 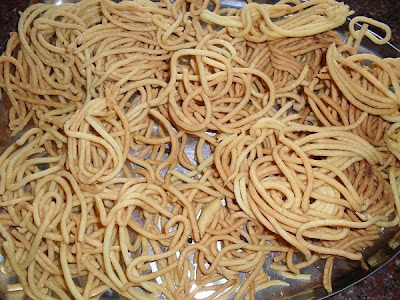 Mix syrup with Thaen Kuzhal using a wooden spatula so that the thick jaggery syrup coats each and every strand. 16. Make balls or store as it is in an air tight container after it cools down. Though the steps may seem elaborate, it can be prepared with great ease once the ingredients are ready at hand. Manoharam is sure to steal your hearts when you bite into the crispy sweet delicacy. 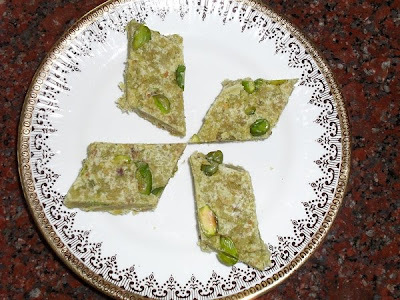 My sister - in- law gave me a recipe for Badam Burfi and she said that the same could be adapted in the preparation of Pista burfi, peanut burfi and mixed nuts burfi. 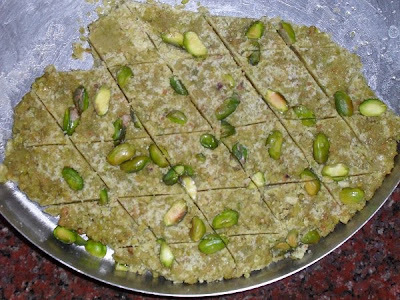 I tried out Pista Burfi and it turned out quite good. While most of the sweets prepared during Deepavali ooze with ghee, this burfi is minus that 'sin '! No flavouring or colouring agent is required as it is awesome in its natural colour and flavour. 1. Blanch the pista, remove the peels and spread out the nuts on a cloth. 2. Keep aside a few bright green ones for topping. 3. Dry grind the remaining pistas into a coarse powder. 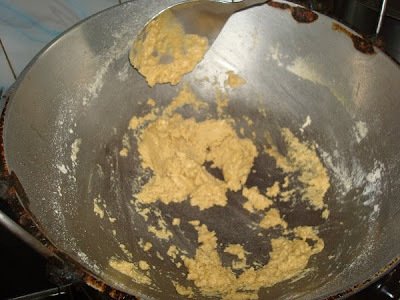 If a smooth burfi is prefered grind it to a smooth powder. 4. Heat sugar with 3/4 cup of water in a thick bottomed pan. 5. Grease a plate with little ghee and keep aside. 6. 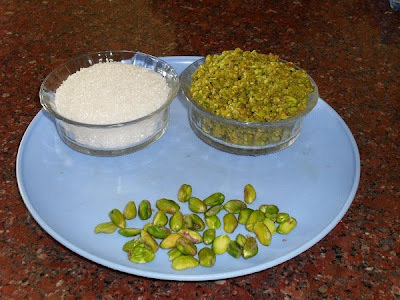 When the sugar syrup reaches a one thread consistency decrease flame and add the powdered pista and blend well. 7. Keep stirring till the mass leaves the sides of the pan. You can see and feel the sugar crystallizing on the sides of the pan. 8. Switch off flame and immediately pour the pista sugar mixture on the greased plate. 9. Quickly sprinkle the whole pistas on top and cover the plate with a greased plastic sheet or an aluminium foil. 10. Flatten the burfi mass by running a rolling pin on top of the foil so that the whole pistas get embedded on the leveled burfis. 11. Since this will harden very fast remove foil and immediately cut out diamond shaped burfis using a sharp knife. 12. Leave it to cool thoroughly before storing in an air tight container. Share the joy and the flavoursome, colourful Pista Burfis with your near and dear ones on a Happy Deepavali day. Deepavali Sweets - Mohan Ladoo - Semolina and Sugar Balls. I do not know how, why or who baptized our traditional sweet dishes with such beautiful names. But the names surely are enchanting and just adorable. One such sweet is Mohan Ladoo meaning Enchanting Ladoo! The taste justifies its name! 1. 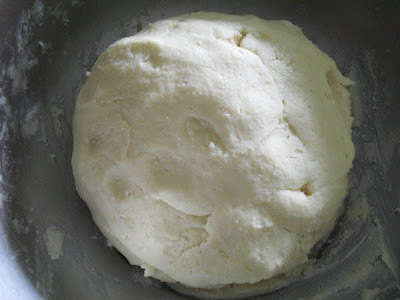 Add salt and knead semolina into a soft but stiff dough using the required amount of water. 2. Cover with a damp cloth and leave it aside for ten minutes. 3. 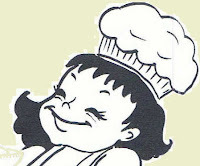 Pinch and knead the dough again and roll out into thin ' poories' using rice flour for dusting. 4. Heat oil in a kadai and drop in a ' poorie' after marking it with a fork. 5. Press down the ' poorie' so that it does not puff up. 6. Turn the ' poorie' now and then so that both the sides are fried well. 7. Remove the crisp reddish brown ' poorie' with a perforated ladle and drain on a kitchen towel. 8. Fry all the 'poories' and allow them to cool down . 9. Powder the sugar and cardamom smoothly in a mixer. 10. Break the crunchy ' poories' and add the bits to the powdered sugar and give one swish in the mixer. The 'poorie' powder should be coarse and it should blend with the finely powdered sugar. 11. Empty the ' poorie' and sugar blend into a bowl. 12. Heat the ghee and fry the cashew nuts to a golden brown colour. 13. Pour the hot ghee and the fried cashew nuts all over the mixture. 14. Mix with a spatula so that the hot ghee melts away the sugar. 15. Take a handful of the mixture and shape into a golf ball size 'ladoo'. A sprinkle of hot milk will facilitate the easy formation of Mohan Ladoos. 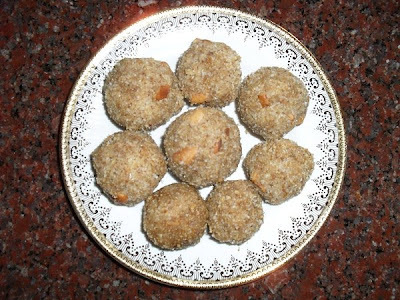 The crumbly "Enchanting" ladoos are sure to enchant anyone who savours it. 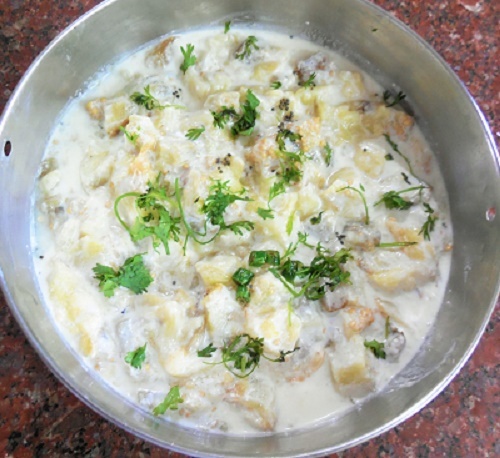 I prepared Vazhai Pazha Thair Pachadi with great reluctance for the first time after my husband's incessant requests. To my greatest astonishment I ended up eating more than half of the portion that I had prepared. From then on I loved to prepare this cool and delicious pachadi very often. 1. Peel and chop the ripe bananas into small pieces. 2. Add salt and lightly mash the fruit with the back of a spoon so that the curd should uniformly be infused with the juice of the fruit. Take care not to mash it up into a pulp. 3. Mix in the thick curds. 4. Heat oil and add the mustard seeds. 5. When the mustard seeds crackle add the cumin seeds. Let the cumin seeds pop up before switching off the flame. 7. Add chopped green chillies and add the seasoning to the pachadi. 8. 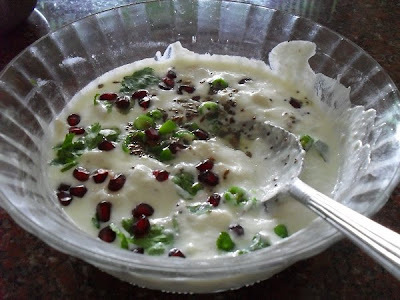 Garnish with fresh coriander leaves and sprinkle the red pomegranate seeds on top. Relish the cool and sweet Vazhai Pazha Thair Pachadi as a side dish or enjoy it as a dessert without adding the green chillies. My mother preserved a charcoal stove ( kummuti ) even after the gas stove invaded our 'heritage kitchen'. She cooked certain dishes only on the kummuti asserting that the flavours of the dish would be enhanced only by doing so. 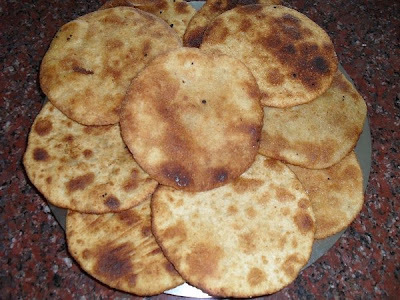 Her pulkas ( Indian wheat bread) looked like unblemished full moons emanating the earthy flavours of roasted wheat flour when they puffed up on the kummuti. The appetising flavour of the eeya chombu rasam in an 'about to simmer stage' on the kummuti would draw us towards the kitchen even when we were not hungry. Likewise we loved the grilled flavour of the sutta kattarikai sitting on the glowing embers of the kummuti. We wholeheartedly accepted our mother's declaration when we relished the sutta kattarikai thair pachadi served along with our meal. mother's store room. We now use the open flame of the gas stove to grill the kattarikkai. 1. Wash, wipe and coat the eggplant with gingelly oil. 2. Place it on the flame of the stove . 4. 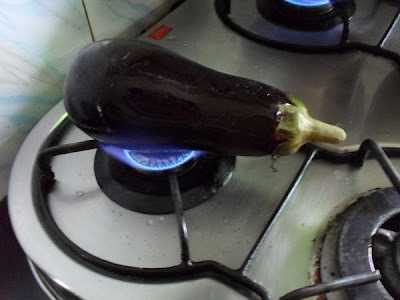 When the eggplant starts looking limp and scalded, switch off flame and leave it to cool. 5. 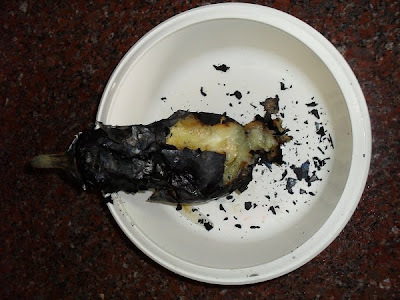 Peel the burnt outer skin of the eggplant neatly and gently mash the cooked eggplant into a pulp using the back of a spoon or chop it into cubes. 6. Add curds and salt and blend well. 8. When the mustard seeds splutter switch off flame and add the chopped green chillies. 9. Pour the seasoning on the pachadi and garnish with chopped coriander leaves. Enjoy the Sutta Kattarikkai Thair Pachadi with any meal. It can be relished with steaming hot rice too. 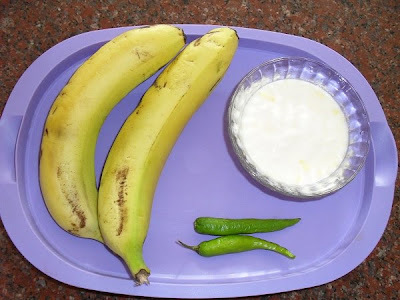 My children prefer my mother's method of preparing vendaikkai thair pachadi to mine. 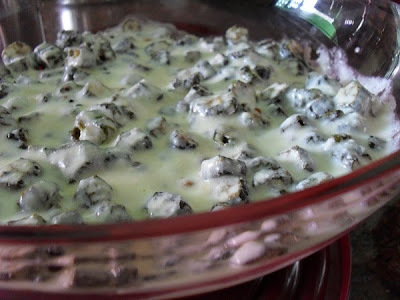 I usually saute the vegetable - okra or lady's finger - in a little seasoned oil and add it to the curd. Here I wish to record my mother's recipe which is adored by every one in the family. 1. Wash, wipe and slice the okra into 1/2" pieces. Even little bit of water is enough to release the slime from the cut okra. 2. 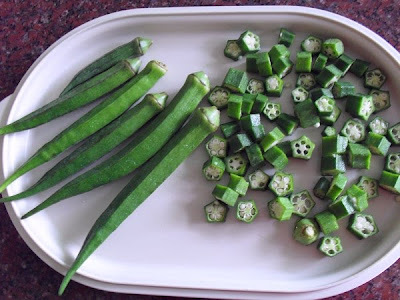 Heat oil in a kadai and drop in a ladleful of okra pieces. 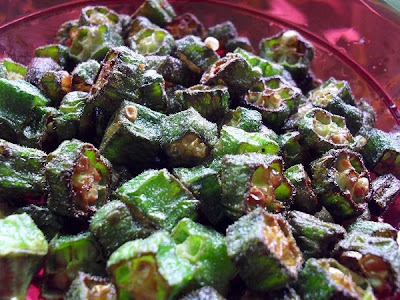 Since the oil will hiss and foam it is better to fry the okras in small batches to avoid oveflowing of hot oil. 4. Remove the fried okra pieces and drain them on a paper towel. 5. 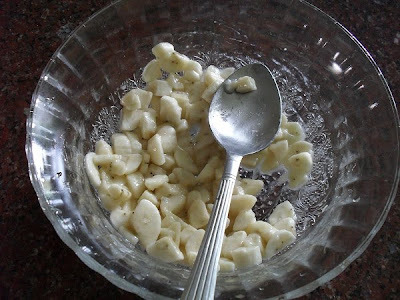 Lightly beat the cool thick curd and salt with a spoon or fork. 6. Mix the fried okra pieces into the prepared curd after they cool down. No garnishing or seasoning is necessary as it will mar the heavenly flavour of fried okra. Enjoy the cool and crisp vendaikkai thair pachadi with spicy bisibele bath or a hot vegetable biriani.